Set among 2600 square meters of immaculate tropical heaven, Villa Natis is a dazzling Luxury holiday rental with 6 Spacious Bedrooms and high-end amenities and a stunning 25m long private swimming pool. Not only it is abundance in size, Villa Natis is elegantly decorated with all the comforts required to give you the best experience in the villa. With some of the key features in this holiday rental including plunge pools in the King’s Bedrooms, Gym and Media Room, this villa is also a chef delight where BBQ Pavilion complete with its Pizza oven can be found. Another great asset of the beautiful villa is the dedicated staffs that will assist you with your needs in discreet manner. 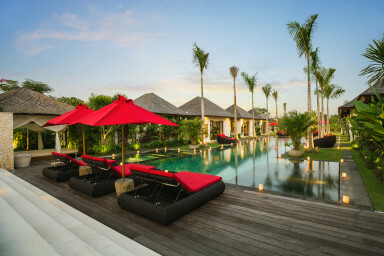 Please Note: The Villa can be rented for 4 Bedrooms / 5 Bedrooms, message us for more details.